Designer Shinwei Rhoda Yen is turning furniture inside out with her ‘mushrooms ate my furniture’ chair. A contemporary addition to any garden, the seat of natural wood provides an excellent respite to enjoy your surroundings or take a break from your green thumb, while its underside provides the perfect habitat to grow mushrooms. Left exposed to the elements, mushrooms will grow and live within the chair for years, feeding off of the nutrients of the wood. 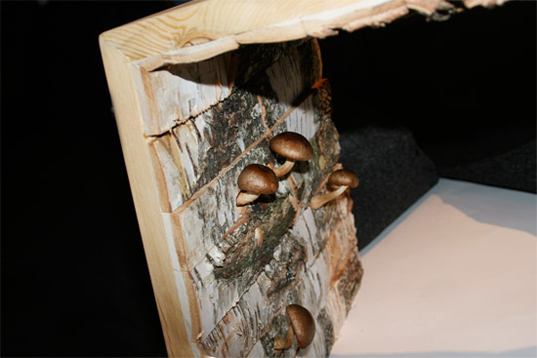 As with all things in nature, the mushroom furniture will eventually degrade, giving way to the life of its inhabitants. We’re always excited to see approaches to industrial design that inspire dialogue about product lifecycles. In the case of this mushroom bench, an inanimate object sustains life and automatically biodegrades as it reaches the end of its lifecycle. Since the bench’s bark has been embedded with mushroom spores, little maintenance is required for those without a green thumb. A trippy idea, although no word if the mushrooms are edible. Very interesting... literally brings life to the interior design. That nature touch can be enhanced with huge photographic prints of wildlife. Yes I worry about invasive species. Something for the manufacturer to think about. The thing I was wondering with all the stuff we buy that has a short "shelf life" anyway I wonder if people would make the connection when they're actually being told it won't last. I may be sad but true.